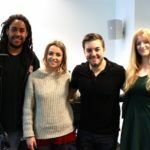 TV presenter and writer Alex Brooker returned to his roots yesterday when he addressed JMU Journalism students. 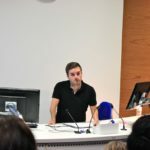 Alex, who co-hosts Channel 4 show The Last Leg, shared insights into a career in television and his time at LJMU, where he studied for his journalism degree. 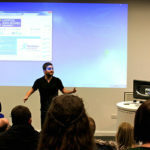 He told a packed lecture theatre: “My degree’s enabled me to do everything that I’ve done so far. The skills I learnt here are a big part of what I do now. 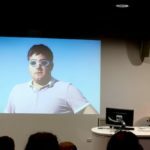 He explained how he first got into journalism, his experiences training as a reporter – and, talking after the lecture, how he accidentally won a place on the British Paralympic Shooting team! Alex had tried unsuccessfully for a place in the table tennis squad, but before he left the Paralympic trials, he was persuaded by a friend to give shooting a go… and ended up being selected. After seeing a Channel 4 advertisement for journalists with disabilities to cover the Paralympic Games, Alex became a trackside reporter for the 2011 Paralympic World Cup. This then led to him interviewing both David Cameron and Boris Johnson at the London 2012 Paralympic opening ceremony. Alex graduated in 2006, and went on to work for the Liverpool Echo before becoming a sports journalist for the Press Association. Last week, Alex appeared on comedy quiz show 8 Out Of 10 cats and is set to appear on Never Mind the Buzzcocks.